Many gardens have soil that is deficient in magnesium. 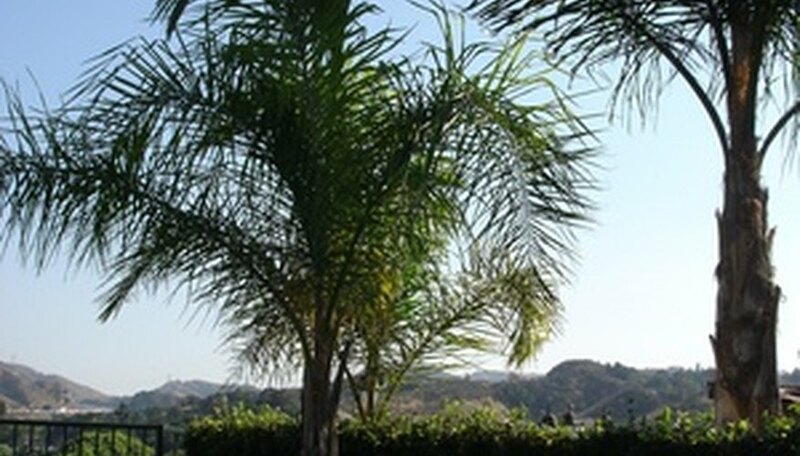 Palm trees require micro-nutrients to thrive, and this includes magnesium. They are inefficient at extracting this nutrient from the soil. Epsom salts (magnesium sulfate) is an excellent source of magnesium for palms. Increasing the magnesium in the soil will make more available to the palms for extraction and prevent premature yellowing of the leaves. Epsom salts are safe to apply and will not easily burn your palm. Look over your palm trees. Look for yellowing of the fronds. If the yellowing is just at the ends of the fronds, it's a classic sign of of magnesium deficiency. Apply 4 to 16 oz. of Epsom salts per 100 square feet around your palm. Spread it out under the entire canopy of the palm to ensure coverage over the entire root system. Water the Epsom salts into the soil. Irrigate with enough water to dissolve the salt without creating excess runoff. You don't want to wash the salt away before it has a chance to be absorbed into the root system. Apply more Epsom salts every two months, or more frequently if the fronds are still yellowing. Use a palm tree fertilizer that is high in micro-nutirents and macro-nutrients in conjunction with the Epsom salts applications.